This kit will be recognised by many OHL engineers, as a number of have been in service since 2000. The equipment is used for the installation and removal of OLE stainless steel cam type and flexible copper droppers using standard insulated pole sets. 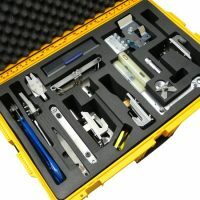 The kit is now supplied by Lawton Tools but at the request of Network Rail has been further developed to enable the removal of Arthur Flury type bolted droppers. The design of the parts from the original kits has been retained, therefore enabling the supply spare parts to cover all kits which are still in service.